Corning agreed to acquire 3M’s Communication Markets Division in a cash transaction valued at approximately $900 million. This business consists of optical fiber and copper passive connectivity solutions for the telecommunications industry including 3M’s xDSL, FTTx, and structured cabling solutions and, in certain countries, telecommunications system integration services. 3M’s Communication Markets Division, which is based in Austin, Texas, has an annual turnover of approximately $400 million for its high bandwidth and optical fiber products. This puts the acquisition at less than 7 times the Communication Markets Division’s estimated forward-annual adjusted EBITDA, including expected run-rate synergies. Corning said it expects the transaction to add $0.07-$0.09 to 2019 EPS. In addition to its operations in Texas, the 3M business also has a dedicated manufacturing facility in Pontchâteau, France, and operations in Hannover, Germany. Approximately 500 3M employees are expected to join Corning upon completion of the transaction. Ericsson will provide the 5G Core network, 5G Radio Access Network (RAN), transport and associated services for Verizon's commercial 5G launch in selected U.S. markets during the second half of 2018. Financial terms were not disclosed. Verizon will deploy the pre-standard 5G commercial radio network and the 5G Core network gear. The deployment follows joint trials of fixed-wireless 5G using mmWave spectrum in multiple cities and residential neighborhoods with different geographies and housing densities. “5G will change the way we work, interact, learn and play. Through our work with Ericsson, we are creating a clear roadmap and building a robust ecosystem that will enable us to maximize the potential of 5G,” stated Ed Chan, SVP Technology Strategy and Planning for Corporate Networking and Technology, Verizon. “Our pioneering work with 5G will make US consumers and businesses among the first in the world to benefit from the transformative services of the new technology. It further illustrates how our global 5G portfolio, designed to support 5G NR as standardized in 3GPP, enables first movers in the early commercialization of 5G networks,” stated Fredrik Jejdling, Executive Vice President and Head of Business Area Networks, Ericsson. In November, Verizon announced that its first 5G application will be a fixed residential broadband service. The first commercial launch will occur in Sacramento, California during the second half of 2018. Additional markets are also expected to launch in 2018. 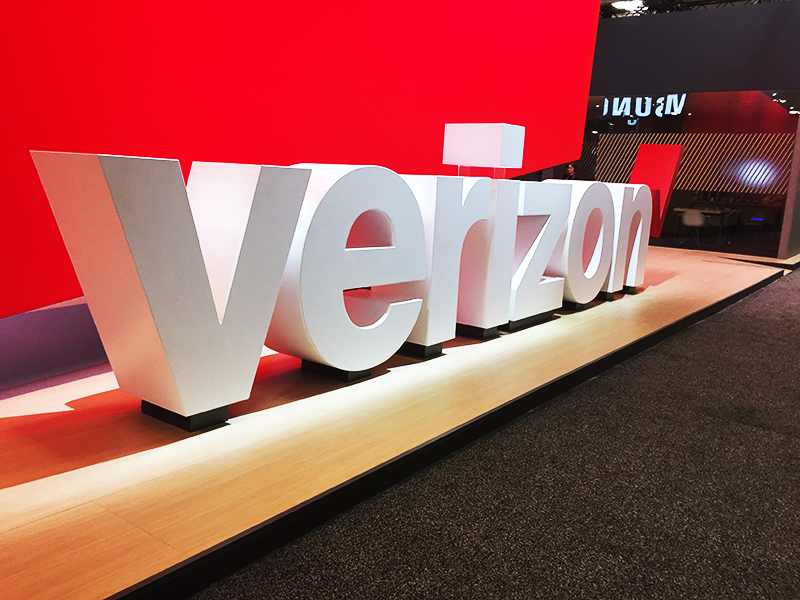 Verizon did not disclose the performance characteristics of its 5G residential service but said it will provide unprecedented wireless speeds for Internet access. Verizon estimates the market opportunity for initial 5G residential broadband services to be approximately 30 million households nationwide. The company also noted that the 5G residential rollout will not have a material impact on Verizon’s consolidated capital expenditures in 2018. CAPEX is expected to be consistent with the past several years. Colt Technology Services has cut network latency between the Tokyo to London financial centres to less than 159 milliseconds. Lower latency is highly desirable for global financial firms. “We are committed to providing global financial firms with a very fast and reliable network infrastructure together with superior customer experience. This is why we are investing heavily in low latency connectivity between the key financial centres and exchanges in Asia, Europe and North America. This year, we have announced improved latency on our Chicago to Tokyo network route and key APAC routes. We are now focusing on the Tokyo to London route. Firms are increasingly using their network to gain a competitive advantage and the Colt IQ Network provides a consistently high experience across all regions,” stated Andrew Housden, VP, Capital Markets at Colt. In 2017, Colt has invested €200 million to upgrade capacity across its global Colt IQ Network. 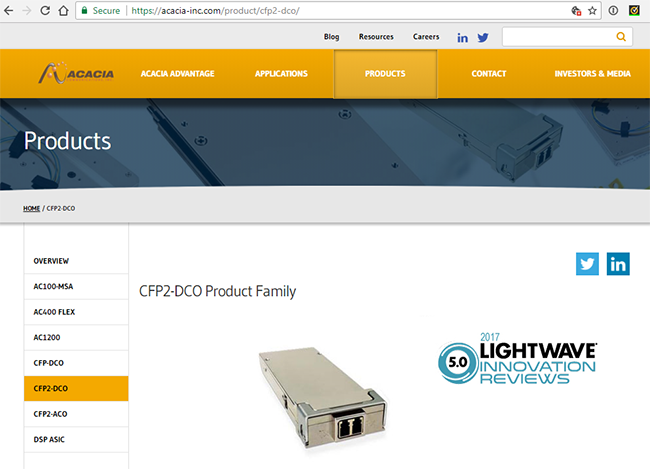 Acacia Communications has begun commercial shipment of a new pluggable coherent CFP2-DCO module supporting 100 Gbps and 200 Gbps transmission in a range of network applications such as including data center interconnect, metro access, metro core, long-haul, as well as emerging applications including remote PHY and client optical interfaces up to 80 km. The CFP2-DCO supports four times the faceplate density of the CFP-DCO. Acacia’s CFP2-DCO incorporates its Meru DSP ASIC, based on 16nm CMOS technology, and its silicon photonic integrated circuit. Internal layer 1 encryption can be enabled for enhanced security applications. The technology was first sampled in 2016. Acacia said these CFP2-DCO modules help to simplify network management and reduce operations costs for providers. The believes that these compact pluggable modules will allow its customers to offer some of the lowest power solutions available in the optical transport industry. Digital host interface – Streamlines integration into existing network equipment and supports field plugability without the need for complex calibration. The use of pluggable optics means that a failure in a single module will affect only the module's port, not the entire line card. Flexible modulation – 100 Gbps transmission using QPSK modulation for metro-core and long-haul applications and 200 Gbps for metro-access applications using either 16QAM for backward compatibility or 8QAM for greater reach and fewer regeneration stages. “Our team has done a great job to develop this low power solution, while maintaining high performance. With the Optical Internetworking Forum (OIF) developing a CFP2-DCO Implementation Agreement, the form factor is positioned for wide adoption in the optical networking industry and with support for up to 400 Gbps, the CFP2-DCO form factor can offer network operators a long-term return on investment,” said Benny Mikkelsen, Founder and Chief Technology Officer of Acacia Communications. Elliott Advisors (UK), which advises funds that collectively hold an economic interest in NXP Semiconductors of approximately 6%, published an open letter stating that Qualcomm's offer to acquire the company is too low. Elliot believes NXP is worth $135 per share on an intrinsic standalone basis – far above the $110 offered by Qualcomm. Elliott states Qualcomm’s offer of $110 per share is acting as "a ceiling on NXP’s valuation", noting that NXP’s peers have traded up 65% since rumors of Qualcomm’s interest arose. Qualcomm agreed to acquire all of the issued and outstanding shares of NXP for $110.00 per share in cash, representing a total enterprise value of approximately $47 billion. The deal will be financed through cash on hand and $11 billion in new debt. The companies expect total annualized synergies of $500 million within two years of close. NXP Semiconductors N.V., which headquartered in Eindhoven, Netherlands, employs approximately 45,000 people in more than 35 countries and is known for its mixed-signal semiconductor electronics. The company was known as Philips Semiconductor prior to 2006. Key markets include automotive, broad-based microcontrollers, secure identification, network processing and RF power. NXP has a broad customer base, serving more than 25,000 customers through its direct sales channel and global network of distribution channel partners. For Q3 2016, NXP reported revenue of $2.469 billion, up 4.4% over a year ago, and GAAP gross profit of $1.184 billion, up 7.7% over a year ago. The combined company is expected to have annual revenues of more than $30 billion, serviceable addressable markets of $138 billion in 2020 and leadership positions across mobile, automotive, IoT, security, RF and networking. 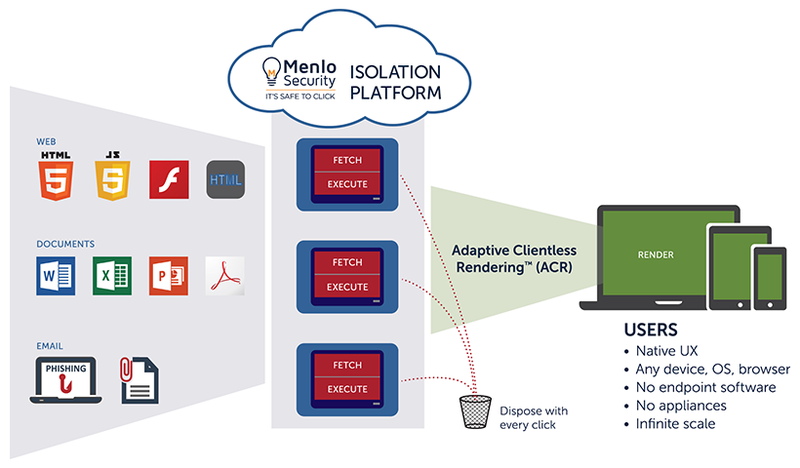 Menlo Security, which offers a cloud-based isolation platform that prevents web-based malware from infecting local machines by running the browser in a cloud-based container, raised $40 million in Series C funding. Menlo Security describes its Isolation Platform as a digital partition, isolating and executing all web content, email links and documents in the cloud, then streaming a malware-free version of the content to employees’ computers via a patented Adaptive Clientless Rendering (ACR) technology. New investors in the round include American Express Ventures, Ericsson Ventures, and HSBC. Existing investors include JPMorgan Chase, General Catalyst, Sutter Hill Ventures, Osage University Partners and Engineering Capital. This brings total investment in Menlo Security to $85 million. 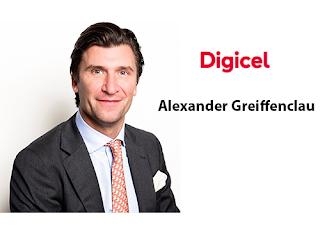 Digicel has appointed Alexander Matuschka Greiffenclau as Group Chief Executive, replacing Colm Delves who stepped down for personal and family reasons. Delves is expected to remain as a non-executive director of Digicel. Greiffenclau previously served as Group Chief Performance Officer of VEON since mid-2015. He previously served as Chief Transformation Officer at Nokia Networks, where he was credited as playing a key role in its transformation. Under Colm’s leadership over the past 13 years, Digicel grew from US$478 million revenues in eight markets to $2.5 billion revenues across 32 markets with a ten-fold increase in profitability and subscribers.